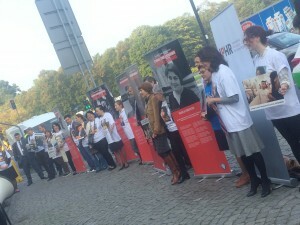 Home Events Warsaw protest: Release political prisoners in Azerbaijan! 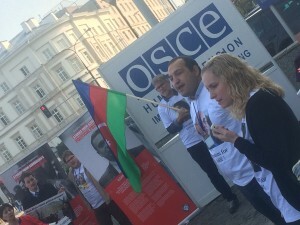 On Thursday 24 September 2015, representatives of International Partnership for Human Rights (IPHR), the Sport for Rights network and other human rights organizations carried out a protest in Warsaw to draw attention to the ongoing crackdown on civil society of Azerbaijan, as well as to call for a strong international response to it. Activists gathered in front of the venue of the annual OSCE Human Dimension Implementation Meeting held in Warsaw, where they greeted arriving OSCE participating State delegations with demands to take action to free political prisoners in Azerbaijan. These include human rights defenders Leila and Arif Yunus, human rights lawyer Intigam Aliyev, NGO activists Rasul Jafarov and Arif Mammadli, investigative journalist Khadija Ismayilova and many others.